I'm going to go with cute. 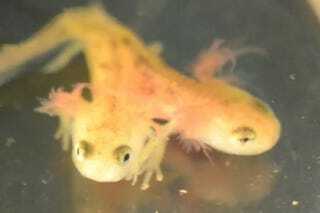 A two-headed salamander tadpole born in a lab in Israel. No, this isn't the result of an experiment. The researchers collected pregnant females in the wild, and this was one of the resulting births in the lab. I'm tickled by the fact they named the heads Arne and Sebastian, after fellow scientists. More info from Live Science.